I'm a noob to the forum. I really want to darkside my vrod, but as you guys know it's hard to find info for Harleys. I have logged some serious google time and cruised a LOT of forums and I can't find a single person who mentions even trying to put a ct on a vrod. I also don't quite understand how the size conversion goes from mt to ct. Any help or suggestions would be great. It's an '04 vrscb running stock tires. Rear is a 180/55 ZR18 on a 5.5 x 18 rim. How much clearance do you have around your tire? The amount of clearance will determin the width you can go to. That in turn will help to determin the series. It has to be an 18" tire to fit the rim. jedishon wrote: How much clearance do you have around your tire? The amount of clearance will determin the width you can go to. That in turn will help to determin the series. It has to be an 18" tire to fit the rim. +1 what Jedison said! If we know the clearance we can help you choose a tire maybe that will fit. That Vrod is just dying to have a darkside! I test rode the Nightrod and that was the first thing I thought of....this beast needs a car tire!!!!!!! I would love to own a Nightrod just can't do it right now! Since the V is more of a performance oriented bike, I'd vie for narrow, like a 185 if I could find one, to lessen the crossover effect. I recall that the V has a pretty good lean angle, or so I was told by the guy who won't catch me in the twisties. Why would someone buy a Vrod and not really ride it? That's like getting a Shelby to haul groceries in. There shouldn't be any cross over effect if the PSI is correct and widest you could go is what I would recommend!! Here is a 245 on a Rocket! Go to around the 5 minute mark and watch that thing perform! There is maybe an inch clearance on the sides, and about 2 inches all the way around. quadancer wrote: Since the V is more of a performance oriented bike, I'd vie for narrow, like a 185 if I could find one, to lessen the crossover effect. I recall that the V has a pretty good lean angle, or so I was told by the guy who won't catch me in the twisties. It does have a pretty good lean angle, better now that the stock exhaust is off - that bracket was almost worn away from draggin the right side. It's a fun bike to ride. twin1300 wrote: There shouldn't be any cross over effect if the PSI is correct and widest you could go is what I would recommend!! I was told I can go up to a 200 in a mt without clearance issues. Don't know about bigger, although some people have complained about rubbing with a 200, supposedly slight differences in brands of tires. Dunno. Sounds like a 205 is a good bet for success. Plenty of those out there. We put a Dunlop Signature 205/75/15 on a friends VTX1300 and he won't part with it. The shoulders on it are somewhat rounded compared to other tires. quadancer wrote: Sounds like a 205 is a good bet for success. Plenty of those out there. We put a Dunlop Signature 205/75/15 on a friends VTX1300 and he won't part with it. The shoulders on it are somewhat rounded compared to other tires. I'll see if I can find one in an 18". My question then is this...is the aspect ratio of any major concern? The width has to fit the available space, and the rim size has to fit obviously, but I fail to understand the second number in tires. I understand what it represents (basically the height of the sidewall), but does it matter for anything when sizing a tire (other than circumference)? The series is for sidewall height. It will affect top end revs, and low end acceleration. Having an inch clearance you shouldn't have any trouble with a 205 fitting. It is an inch wider than your 180, or a half inch on each side. The hard part will be finding a 18 inch tire. Might look for a 60 series. There are come good tire calculator charts on here. just do a search, put in the old numbers and the new numbers to get a comparrison. I would look for one that is 1 inch or less bead width wider than your rim width. Simply put: 180x your aspect percentage is 99mm sidewall height. So for an equal tire in a 205, it would need to be a 48. The wider you go, the lower that number. Well, I can't find a 205 in an 18", regardless of series. I also couldn't find a 195 or 185. If I'm just looking in the wrong places, can someone give me a good whack in the right direction? What I did find was a 215/55R18. Those seem to be relatively common. Is there any chance that's going to work. The Falken tire site says it's recommended for rim widths of 6.0 - 7.5. Will that be an issue with a 5.5" rim? That should fit from the dimensions you gave. It will be just under 3/4" wider on each side than your stock tire. With a 5.5" rim you should have no trouble at all mounting a tire reconded for a 6" rim. Some have had trouble with the Falken, but they were trying to put them on 4" rims. Take pictures of the process so the next guy can see that it works. I put up the Vintage tire links because that's probably how you're gonna have to do it. I've seen a Toyo Proxie T1R 215/45/18 on a 1800VTX F and it fit with plenty of room. Also a great tire in the twisties! That means nothing bigger than what's on there without some work. That means no ct on my bike, as I can't find a single tire the same size as the stock mt. I even tried going a little smaller, just to try it, and came up short for tires in that size as well. usually go on, even more than that. Hmmm...it's even hard in this size to find. I finally did it guys. Bought a 205/40/18 Nitto Neogen and mounted on the rim. The rim may look aftermarket but it is a stock only machined and powdercoated. There is plenty of room from the top belt guards and just enough from the bottom without doing any work to it. 5.5 inches wide. I cant post pics, but if your interested just pm me your email or something and ill send. It handles really great and looks badass!!!!! JOHNJOHN8569 wrote: I finally did it guys. Bought a 205/40/18 Nitto Neogen and mounted on the rim. The rim may look aftermarket but it is a stock only machined and powdercoated. There is plenty of room from the top belt guards and just enough from the bottom without doing any work to it. 5.5 inches wide. I cant post pics, but if your interested just pm me your email or something and ill send. It handles really great and looks badass!!!!! 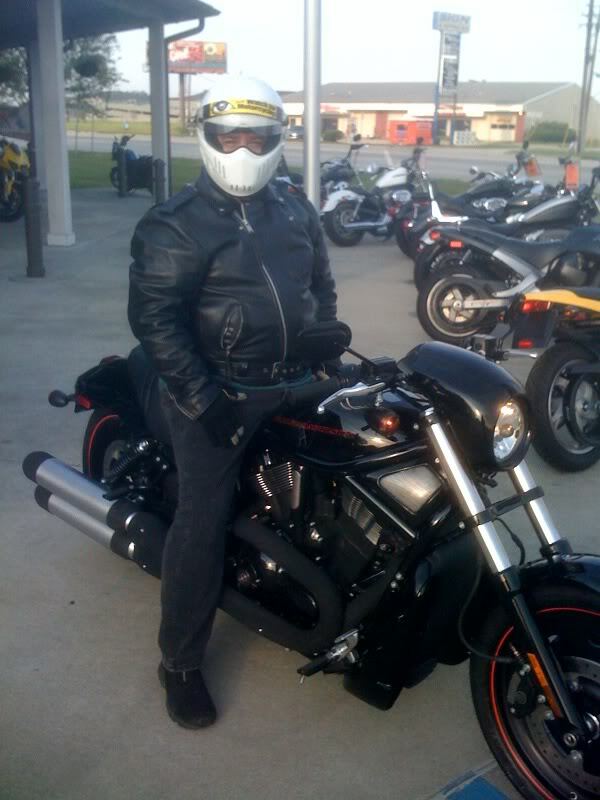 Thanks again to JohnJohn for the posting about what was probably the first darkside vrod! FWIW, since JohnJohn's post I have found that a Yokohama Avid Envigor 215/45R18 will also replace the 180/55R18 stock tire after a little housekeeping under the fender.